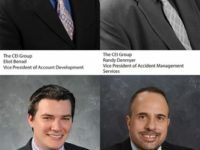 TREVOSE, PA, November 2, 2017 – The CEI Group, a global leader in accident management and driver safety programs, today announced the appointment of four new CEI Vice Presidents. These leaders have been major contributors to the success that both CEI and Element have realized over the past few years and bring rich experience that will help CEI going forward as the global leader in accident management and driver safety programs. First, Eliot Bensel has been named Vice President of Account Development. Eliot most recently served as Vice President of Technical Sales & Advisory Services for Element Fleet Management, responsible for analytical consultation in support of risk, safety, and accident management programs. Over the course of a 25-year career at Element, he has led the Accident Management, Safety, Driver Records and Fleet Administration operations. Next, Randy Denmyer has been promoted to Vice President of Accident Management Services. He began his career at Element in 2002 in vehicle accident services. He assumed several management roles beginning in 2009, responsible for repair management, supplier network and quality, and accident management delivery in the Sparks operating center. In that time, Randy has contributed to driving excellent levels of service. Ken Latzko has been promoted to Vice President of Sales and Marketing. Ken leads CEI’s sales, marketing, and sales support teams. He joined CEI in 2004 and served in a variety of positions with increasing responsibility in operations, sales support, communications, and sales. His experience includes operations troubleshooting and customer service for large accounts in the U.S. and Europe, strategic planning, and directing CEI’s growth in all fleet markets. Ken is an EMBA candidate at the Haub School of Business in Philadelphia. Finally, Chris Villella has been promoted to Vice President of Strategic Relationship Management. Chris is responsible for strategic consulting and implementation activities for all of CEI’s accounts and business development of accounts in special markets. He joined CEI in 1989 as a subrogation specialist and advanced to Senior Manager in loss recovery and insurance services in 2005, a position he held until being named Sr. Director, Account Management in 2015.